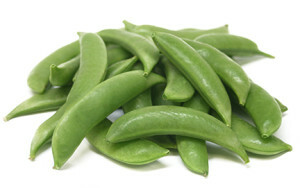 These hybrid of green peas and snow peas is of chock full of vitamin C and B as well as being equally delicious raw, lightly blanched (to keep the green, green) stir fried and as a garnish. When buying look for firm, wholly green crisp pods. And duh, they should snap when you break them in half. The following recipes are all simple and can be thrown together and prepared in under 30 (some as little as 10) minutes. NOTE: some sugar snaps have a tough string along the edge of the top. This string needs to be removed before cooking. Just grab the stem and gently pull it, it should easily “un-zip” from the snap. Heat the oil in a large skillet. Add mushrooms, snap peas and green onions and saute, stirring constantly, until snap peas are bright green and mushrooms have released their liquid, 3 to 4 minutes. Add garlic and red bell pepper and cook stirring constantly for 1 minute. Add the soy sauce and water chestnuts and cook for 3 to 4 minutes, stirring constantly. Serve immediately. Serves 4. This recipe can be doubled or tripled. In a salad bowl combine the snap peas, pepper, carrots, radishes, celery and lettuce into a large salad bowl and set aside. In another bowl combine the oil, vinegar, soy sauce, brown sugar, hot sauce, and ginger in a small bowl. Whisk to combine. Pour the dressing over the salad and mix to combine. Sprinkle the peanuts over the top and serve. Serves 6 to 8. 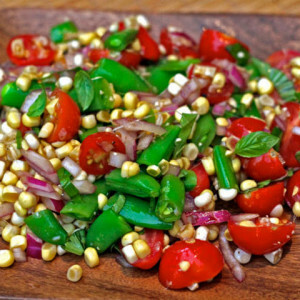 .In a bowl combine the cooked couscous, snap peas, red onion, parsley, carrot and cherry tomatoes. Mix to combine. In another bowl whisk together the lemon juice, olive oil. Drizzle the dressing over the salad, mix to coat, season with salt and pepper to taste. Let sit for at least 20 minutes before serving for the dressing flavors to meld with the couscous and vegetables. This salad can be made in the morning, covered and refrigerated, but then don’t add the tomatoes until just before you serve it. Serves 6 to 8 as a side salad. In a jar with a tight lid combine the vinegar, lemon juice, mustard, garlic, sugar and oil. Put the top on and shake to combine. Set aside. (You can do this in a blender or food processor if you prefer but this is easier and you have a built in storage container) Season with salt and pepper. In a bowl combine all the salad ingredients EXCEPT the salami. Drizzle the 2/3’s (some people prefer to use it all) of the dressing over the top and toss to coat. Sprinkle the chopped salami over the top and serve with the remaining dressing. Serves 6 to 8.